Dolores Huerta has been spreading this “magic dust” for over six decades. Ms. Huerta co-founded the National Farmworkers Association – now called the United Farm Workers (UFW) – in 1962. Ms.Huerta became well known as a thought leader, organizer, lobbyist, and negotiator. As lead organizer for the historic Delano grape boycott of 1965, she convinced more than 17 million consumers to stop buying grapes in support of workers’ demands for collective bargaining rights. The boycott was as much a battle against growers as it was against the U.S. government, which interfered by purchasing grapes to send to U.S. soldiers in Vietnam. Nonetheless, the campaign succeeded, and Ms. Huerta led the negotiations that followed to secure collective bargaining agreements between the California grape industry and UFW. The fight for pesticide regulation is inextricably linked to the fight for immigrant rights. “Growers don’t want [their workers] to be legalized,” said Ms. Huerta in Dolores. “Because once they’re legalized, they can protest against pesticide poisoning, they can protest against the low wages they’re being given,” she said. As Ms. Huerta points out in an interview with NPR, women and children working in the fields are especially vulnerable to pesticide poisoning: “The pesticides in the fields really affect women even more than they do men. They affect children and they affect women more than they do men.” Research indicates that exposure to common agricultural pesticides, both during development and in adulthood, is associated with increased susceptibility to breast cancer. Across the board, studies show that children’s developing organs create “early windows of great vulnerability” during which exposure to pesticides can cause lifelong damage. Ms. Huerta represents one of many women who have been standing up for the right to healthy and safe working conditions. “There were more women involved in the UFW than probably every other labor union in the United States combined,” said author and organizer Randy Shaw in Dolores. However, many believe that Ms. Huerta was not given the credit she deserved for her accomplishments. Ms. Huerta was the only woman on the executive board during her tenure in the UFW, and several of those closest to her lament that fellow board members resisted her leadership expressly because of her gender. When co-founder Cesar Chavez died in 1993, the board chose not to elect Huerta as the new president due, many believe, to their reluctance to appoint a female leader. In August, the UFW executive board appointed union Secretary-Treasurer Teresa Romero to replace UFW’s retiring president Arturo S. Rodriguez. She is the first Latina and immigrant president of a U.S. national union. “We’re knee deep in sexism when it comes to why she isn’t studied, and why people don’t know her,” said educator and activist Curtis Acosta, featured in the 2017 documentary. According to Mr. Acosta, Ms. Huerta publicly criticized the UFW itself for being “rife with sexism.” According to Mr. Acosta, Ms. Huerta said, “I even said to Cesar at one point in time, I said, look, we have a lot of machismo here in the farmworkers movement, and I am not going to take it anymore.” Her message to the young women and Chicana girls with whom she now works – be bold and take credit for your work. As some of Ms. Huerta’s colleagues note, her erasure from history is not only the product of sexism, but also a testament to her continued threat to those in power. In 2010, the Texas State Board of Education removed Dolores Huerta from the state’s history curriculum. In that same year, fueled in part by Ms. Huerta’s controversial messaging to students at a Tucson school, the Arizona House Education Committee passed a bill to ban Ethnic Studies in the state. Addressing the committee at the bill’s hearing, then Superintendent Tom Horne characterized Ms. Huerta as “a former girlfriend of Cesar Chavez.” With the passage of the ban, Mr. Horne and the Education Committee struck deeper than insult – the law effectively targeted and removed a longstanding Mexican-American studies program that had empowered Tucson’s Chicano students to hold pride in their ancestry and stand up for their rights. 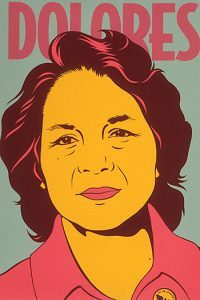 Though the newly designated Dolores Huerta Day will not be recognized as a legal holiday in either Washington or California, its passage provides an opportunity for education and critical reflection. The day offers an opportunity to recognize and support the work of Dolores Huerta and join with advocates standing up for justice in their communities. As part of the 37th annual National Pesticide Forum this past weekend, Beyond Pesticides featured a panel of youth advocates for environmental justice. Stay abreast of updates on our Youtube page to learn directly from advocates how you can be a part of the movement to grow out of our oppressive present and into an ecologically and socially just future of food production. This entry was posted on Wednesday, April 10th, 2019 at 12:00 am	and is filed under Environmental Justice, Farmworkers, Uncategorized. You can follow any responses to this entry through the RSS 2.0 feed. You can skip to the end and leave a response. Pinging is currently not allowed.